The Austin Motor Company was founded in 1905 by Herbert Austin, and a plant at Longbridge, Worcestershire (later in Birmingham) was established. The company was merged in 1952 into the British Motor Corporation Ltd. 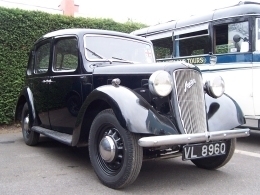 The Austin 10 was in production (with upgrades) from 1932 to 1947, and was Austin's best selling car of the 1930s. The saloon model of the 10 was re-styled in 1937 as the 'Cambridge'. A contemporary advert, extolling the reliability can be seen here (Grace's Guide website). One of the Austin slogans of the 1930s was "You can depend on an Austin". First registered 11 January 1937, this car had one owner, the LeTall family, until it came to the Society. VL 8960 was a 21st birthday present to Vincent LeTall from his grandfather, the car having covered 100,000 miles before Vincent received it. This mileage was achieved by the reps of LeTall's flour mill in Lincoln, which was in Princess Street off the High Street. The mill has since been turned into flats. On our November 2003 Open Day Vincent's widow Elsie and daughter Wendy were taken for a trip in the 10. Mrs LeTall recounted how they used to go to Scarborough in it. They also used it for their honeymoon. July 2012 - We attempted to start the Austin 10 prior to open day but found that it was blowing from a couple of the head studs and refused to start. In the weeks following the open day the cylinder head was removed by Michael and Lee, on removal it was found that the head gasket was in a poor state. It was also decided that it would be prudent to have the head skimmed so it was skimmed by Northern Road engineering in Newark who did a good job. We managed to obtain a new head gasket from the Austin 10 drivers club along with a few small associated gaskets. Reassembly of the top end of the engine should happen in the next few weeks now we have all the parts then we can get it booked in for an MOT. According to the tax disc on the car it was last taxed in 2006 so it will be good to have this back on the road. October 2012 - The '10' is now running after its full service, head gasket replacement and new exhaust system - it still has a small running issue which we are currently fault-finding and as soon as its sorted it will be ready for an MOT. January 2014 - The fuel pump has been repaired and refitted. July 2015 - The 'black 10' has had its valve guides replaced and the car now runs well. After a thorough check underneath, the car will be presented for its MOT which will be the first in ten years.